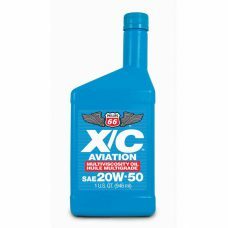 PHILLIPS 66 X/C Aviation Oil 20W-50 is an ashless dispersant, multigrade engine oil specially formulated for year-round use in aircraft piston engines. It provides distinct performance benefits compared with single-grade engine oils, including easier starting and faster oil circulation at low temperatures, reduced warm-up time, and reduced oil consumption in most engines. It maintains its film strength under high loads and at high temperatures to protect against wear and piston scuffing. The ashless dispersant formulation helps minimize the formation of engine sludge, varnish, piston deposits and combustion chamber deposits, resulting in a much cleaner engine compared with the use of straight (non-dispersant) mineral oils.